Guaranteed 25% increase in tire life! The World Leader in Balancing Technology! The new Centramatic Fleet Guarantee Program is the single most effective way to increase tire life and reduce drive & steer component maintenance than any other factor a fleet operation can do. Purchase and install Centramatic Balancers on ALL axles. 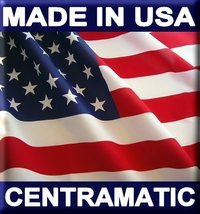 If you don’t see at least a 25% increase in tire life, you can return your Centramatic Balancers purchased through the Centramatic Fleet Guarantee Program and receive a full refund. For nearly the cost of one tire you can outfit all three axles on a truck! 2-4% Increase in fuel economy can be realized because rolling resistance is reduced. Guaranteed 25% increase in tire life. Reduced maintenance costs on steer and drive components. Improved “Driver Retention” because truck rides significantly better. Call Mike Hagar at 800-523-8473 for a customized estimate of how much you can save!